the world's best beach sandals. Maintenance involves hand washing with water and liberal saddle soaping. As the sandal breaks in, the strap stretches and you simply adjust the entire strap to maintain a proper fit (which makes them feel more like a shoe than a sandal). They are clever and functional. His sandals have been copied by others, but never duplicated, so beware of other sandals which appear the same, but don't offer the fit, comfort or function of Michael's! 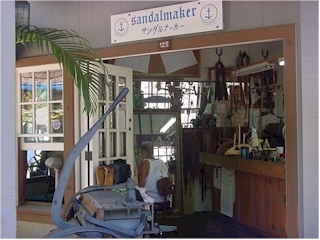 Island Sandals is tucked away in a niche of the Wharf Shopping Center near the postal center at 658 Front Street, Space #125, Lahaina, Maui, HI 96761, (808-661-5110). Michael Mahnensmith is the proprietor and creator of custom made sandals. He learned his craft in Santa Monica from David Webb who was making sandals for the Greek and Roman movies of the late 50's and early 60's. He rediscovered his sandal design from the sandals used 3,000 years ago by the desert warriors of King Solomon in Ethiopia. He developed the idea while living in Catalina in the 1960's and copyrighted it in 1978. With the exception of a nonskid synthetic heel, the sandals are all leather, which is porous and keeps the feet cool and dry. They feature a single strap harness, which laces around the big toe, then over and under the foot, and around the heel, providing comfort and good arch support. ISLAND SANDALS© are handcrafted from top grain leather, so they will need special care. Do not go in the ocean with your sandals. Step 1. Begin with the slotted end of the strap. Allow one 1/4" space from the heel riser to the slot. Step 2. Position the foot back from the front of the sandal at least 1/4" for ladies and 3/8" for men. This will protect your toes. Step 3. Tighten the strap around your heel first. Make the inside heel riser vertical. Without changing your foot's position, continue to follow the strap. Step 7. Tie the knot (see drawing). Make sure it is flat and triangular. Cut off the excess strap. Step 8. Break-In and First Saddle Soaping. Take a short walk in the grass (off road) about 100 yds. This walk may be uncomfortable, so take it slow and easy. When you return, take both sandals off over the heel, no need to untie the knot to take the sandals off & on. "Peel them off." Use a small piece of medium sandpaper to lightly sand all 4 corners of the straps (3 strokes), where they go between the toes. Then make a thick foamy lather with saddle soap, sheep's wool and water. Lather up the entire top & strap. Do not move the strap. Put the sheep's wool down and rub briskly with your hands until all of the saddle soap foam is absorbed. Do not rinse. This first time is the only time you will use saddle soap without washing the sandal in fresh water and dripping 1 hr. by wiggling in and pull up the back strap. Make sure the strap under the arch is up and in good position. Position your foot (Re: Step 2) and go for your second walk, as you walk, look at your foot and if necessary, kick right or left or fore or aft to hold your proper position for safety & comfort and soon your foot will make a print and will hold the position naturally. Tighten as needed from then on. Enjoy! To clean your sandals, untie the knot and loosen the entire harness. Wash off the dirt by hand with fresh water. Back the strap through the pattern at least 3 inches. Wash again to be sure every inch of it is clean. When clean, shake off the excess water. Let drip for one hour. saddle soap and water and rub deep into the damp leather. Move strap and repeat. Do not rinse. This will keep the leather soft and flexible. off new excess leather. Wear till dry. To order more ISLAND SANDALS © for yourself or others, have a friend trace both feet while standing evenly balanced. 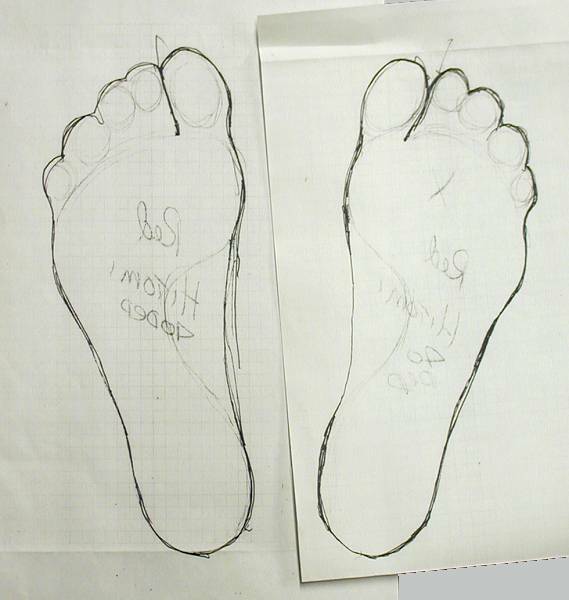 Be sure the pencil is vertical and draw into the big toe space (see drawing). be careful, as the feet are always somewhat different. ISLAND SANDALS © can be resoled by a good cobbler. Ask for a hard leather half sole to be laminated onto the sandal and sewn down. Make sure the strap still slides for adjustment. A new heel can be put on as well. The charge for ladies to size 11 is $250 for the right shoe and the left shoe is free. Men's sizes to size 13 are $275. Michael stresses the importance of good footwear while on Maui, so stop in upon your arrival for measurement, or sandals can be ordered by sending a tracing of both feet and big toes (or by having an "authorized agent" do so) along with cashier's check or money order to Island Sandals. Shipping & handling fees are: $12.00 U.S., and $25.00 for International sea mail, add $6.00 for each additional pair of sandals shipped. Include this information in snail mail. Trace feet on two separate pieces of paper and snail mail to Island Sandals. Please use PayPal for a credit card or send a money order, check or cashier's check with your foot tracings. Allow up to one month for delivery.